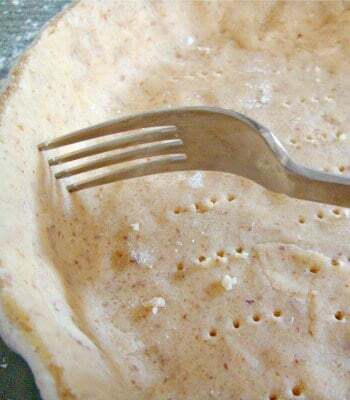 Baking blind (sometimes called pre-baking) is the term used to describe the process of baking a pie, tart or flan base with pastry, usually shortcrust pastry, without the filling. The technique of blind baking a pastry base is necessary if you are going to fill the case with raw or ‘wet’ fillings, such as the egg mixture for a quiche, or a cake mixture, such as in a Cherry Frangipane. As a rough guide, if the filling has a shorter cooking time than the pastry, then you will need to blind bake first. Failing to use this method will most likely result in a raw and soggy bottom to your pastry case as the filling will soak into the pastry. 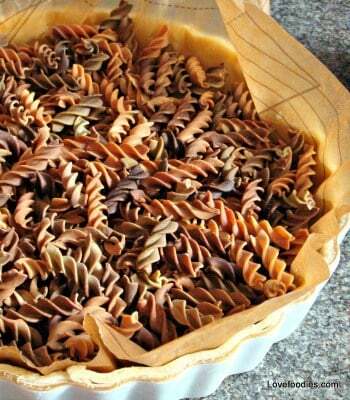 The idea is to roll out the pastry and line your flan dish, then using a sheet of grease proof or foil, line the surface and then place some weight on the covered surface, such as dried pasta, rice, clay balls. The weight will stop the pastry forming huge air bubbles (I have an old ice cream box with dried pasta which I keep and use over and over again for this process. I also keep the grease proof paper folded in the box too for the size of my flan dish so I don’t have to mess around cutting a new piece each time I need to blind bake. 1. Turn your oven to 180 C, 375 F,Gas 5. 2. 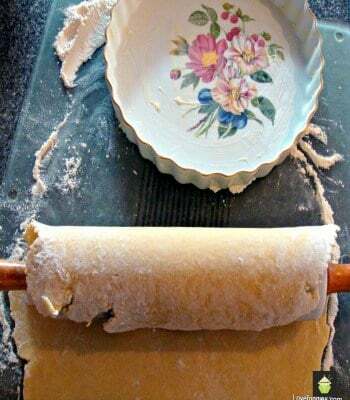 Place your rolled out pastry in to your chosen dish. 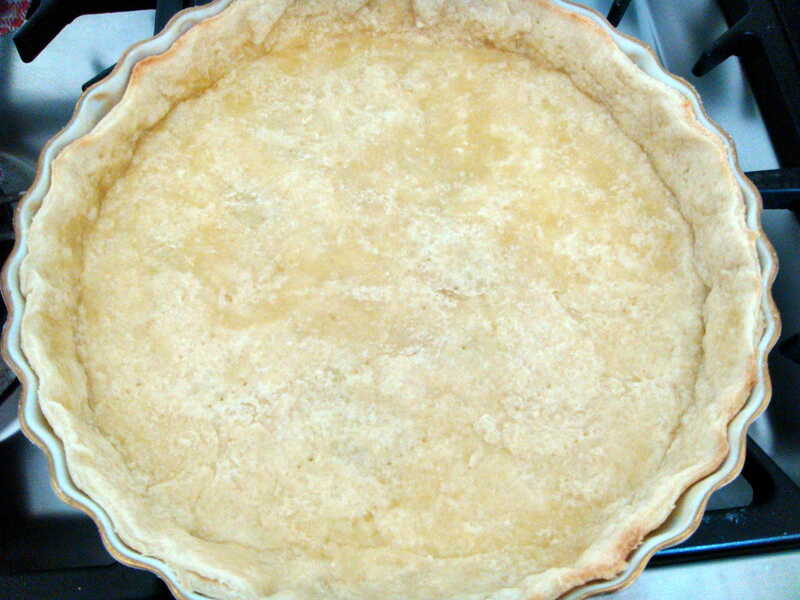 Make sure you gently push the sides around the dish and trim any excess pastry. 3. If you see any cracks or missing bits of pastry, use the excess from your trimming to patch these areas. 5. Line the flan dish with grease proof or aluminium foil, make sure there is enough to cover up the sides. 6. Place enough weights to fill the dish and distribute evenly, paying particular attention to the sides as these areas will form big bubbles if not weighted down. 7. Place in the oven for 20 – 25 minutes (for a 23 cm, 9 inch dish). If using smaller cases, reduce the cooking time. 8. When ready, the flan case should look like the photo on the below left. Say about 70% cooked, and ready for the filling. *** Please note, if you want a completely cooked Pastry case, 1/2 way through the cook time, remove the weights and return the pastry to the oven to cook right through. Baking blind (sometimes called pre-baking) is the term used to describe the process of baking a pie, tart or flan base with pastry, usually shortcrust pastry, without the filling. The technique of blind baking a pastry base is necessary if you are going to fill the case with raw or 'wet' fillings, such as the egg mixture for a quiche, or a cake mixture, such as in a Cherry Frangipane. As a rough guide, if the filling has a shorter cooking time than the pastry, then you will need to blind bake first. 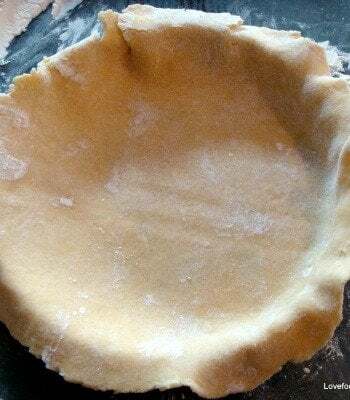 Failing to use this method will most likely result in a raw and soggy bottom to your pastry case as the filling will soak into the pastry. Turn your oven to 180C, 375F,Gas 5. Place your rolled out pastry in to your chosen dish. 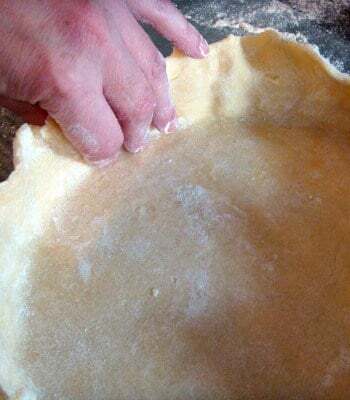 Make sure you gently push the sides around the dish and trim any excess pastry. 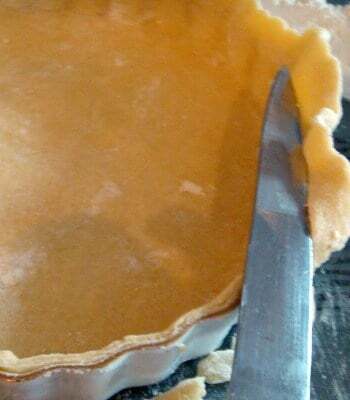 If you see any cracks or missing bits of pastry, use the excess from your trimming to patch these areas. Line the flan dish with grease proof or aluminium foil, make sure there is enough to cover up the sides. Place enough weights to fill the dish and distribute evenly, paying particular attention to the sides as these areas will form big bubbles if not weighted down. Place in the oven for 20 - 25 minutes (for a 23 cm, 9 inch dish). If using smaller cases, reduce the cooking time. When ready, the flan case should look like the photo on the below left. Say about 70% cooked, and ready for the filling. This was very helpful!! Thank you! this is great…i always see my gram do this but didnt know what she was doing. and now you know!!!! Gram’s are always right!